WASHINGTON — After months of work, a tax plan released Wednesday by the White House and House Republicans would provide large tax cuts to both corporations and individuals. The highly anticipated proposal still has a long way to go before it can be voted on, but Republicans outlined their objectives in a nine-page document Wednesday morning. The plan includes long-held Republican goals of reducing the corporate tax rate and simplifying the tax code. It lowers the corporate tax rate to 20 percent and eliminates four income tax brackets. It doubles the standard deduction and increases the child tax credit. It also repeals the estate tax but keeps the deductions for mortgage interest and charitable giving, all tax breaks that tend to affect high-income tax payers. But it is expected to cost trillions of dollars and Republicans haven't yet presented a clear way to pay for it. In a speech in Indianapolis, President Donald Trump pitched the GOP's plan as "the largest tax cut in our country's history." "We want tax reform that is pro-growth, pro-jobs, pro-worker, pro-family and yes, tax reform that is pro-American,” Trump said. Doing away with the current system — “outdated,” “complex,” and “burdensome" — would incite a “middle class miracle,” Trump said, that would be better for America’s working class than for its highest earners. That’s not good for Trump, he told the crowd, but it’s the “right thing” to do. “What is good for me,” Trump said, both for his legacy and as president, “is if everything takes off like a rocket ship. Like it should have for 20 years. That’s good for me. That’s good for everyone." House Republicans were briefed on the plan at a gathering near Capitol Hill on Wednesday before they officially released the plan later in the day. Republicans say this will be a plan that grows the economy and creates a more fair tax system. "Today we are taking the next step to liberate Americans from our broken tax code," House Speaker Paul Ryan said. "This unified framework delivers a new tax code that is simple, that is fair, that is pro-growth and pro-family: cutting taxes on hard-working Americans so that you can keep more of your own hard earned paycheck, simplifying the tax code so that you can file your taxes on a form the size of a post card." Sen. Tim Scott, R-S.C., said, "If I could say it as simply as possible, I would say that this tax reform conversation is about #keepyomoney." But Democrats say that the plan will harm the middle class while giving major tax breaks to the wealthy. Senate Minority Leader Chuck Schumer called it a “disappointment” because it “deviates” from Trump’s promise to benefit the middle class. And Sen. Ron Wyden, D-Ore., said that the doubling of the standard deduction is a “massive step backwards” because it also eliminates personal deductions, which is how many middle-class families lower their tax bill. Conservative Republicans have come out in support of the plan, which is a good sign for leaders who often battle with the most conservative members of their party over policy. The 30-member House Freedom Caucus called it a “a forward looking tax reform framework” that they were excited to send it back to President Donald Trump to sign. And Rep. Mark Walker, R-N.C., chairman of the 170-member conservative Republican Study Committee, called it "good news." "Republicans have to keep our promises to the American people on tax reform, repealing Obamacare, and securing the border before the end of the year," he said in a statement. More than anything, however, Republicans are unified in their desire to pass tax reform after failing so far to repeal the Affordable Care Act, one of the party's other big legislative agenda items. Sen. Lindsey Graham, R-S.C., said passing tax reform is critical for the Republican Party. "It’s the difference between succeeding as a party and failing," he said. "It’s the difference between having a majority in 2018 or losing it. It’s the difference between one term and two." To help, Trump was to travel to Indianapolis later Wednesday to begin to sell the plan to the public. While the plan is aggressive in slashing taxes, one problem is how much it will cost, and how to pay for it. Estimates show that it would cost upwards of $5 trillion. "The main challenge for lawmakers will be finding ways to offset the fiscal cost of the tax cuts that have been proposed," said Scott Greenberg, senior analyst with the Center for Federal Tax Policy at the Tax Foundation. "Lawmakers will have to be bold and creative in identifying tax preferences to be eliminated, in order to make the math work. 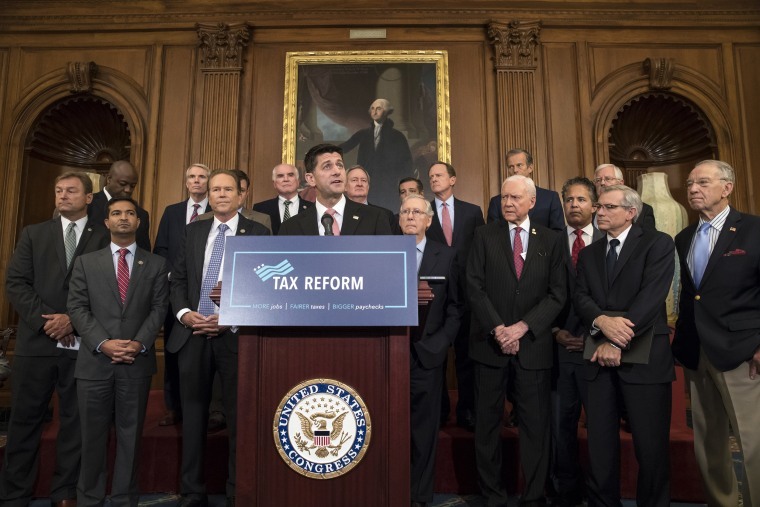 Today’s proposal hints at some of the avenues that lawmakers will pursue to pay for their desired tax reductions; these include eliminating business tax credits, repealing individual itemized deductions and limiting business interest deductions." Nearly doubles the standard deduction to $12,000 for individuals and $24,000 for those filing jointly. Reduces the number of tax brackets from seven to three with the highest being 35 percent and the lowest being 12 percent. Increases the child tax credit to an unspecified amount over the current $1,000. Adds a $500 credit for the care of nonchildren dependents. Eliminates most deductions, including the state and local tax deduction. Preserves the mortgage interest deduction and the charitable deduction, two of the most popular deductions that more often benefit wealthier Americans. Reduces the corporate tax rate to 20 percent. Caps the small business rate to 25 percent. Transitions the global corporate tax to a territorial tax. Aims to repeal the corporate AMT. Garrett Haake, Jonathan Allen and Alex Moe contributed.